On the island of Honshu in Japan, situated in Wakayama City near the sacred mountain Koya-san and Kumano-kodo, sits the Maruwa laundry – a family-owned business that has been involved with the local hotel and restaurant industry for over 50 years. The laundry division was created in the early 1990's and now focuses on two separate businesses – one concentrated on hospitality and food and beverage linen, the other on healthcare linen. 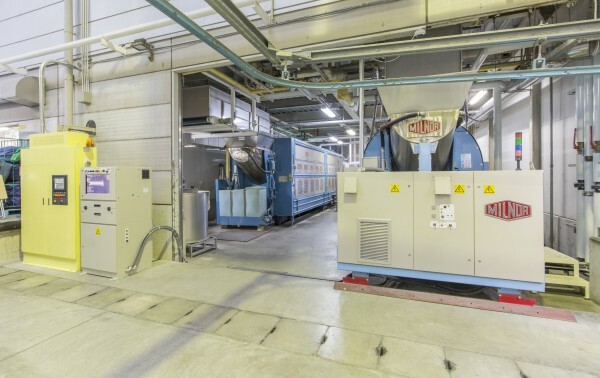 Housed in one large building, the Maruwa laundry handles hotel and restaurant linen on a rental basis with CBW® tunnels, whereas the Momonokikai plant, a part of Maruwa, handles exclusively healthcare linen, mainly using washer-extractors and a locally manufactured CBW. Employing more than 100 workers, including individuals with disabilities, Maruwa laundry is an important employer in the region. Maruwa offers every worker a fair chance to participate in the local economy and also provides housing facilities and care for its employees. High ethical and quality standards are the main pillars of the Maruwa company. 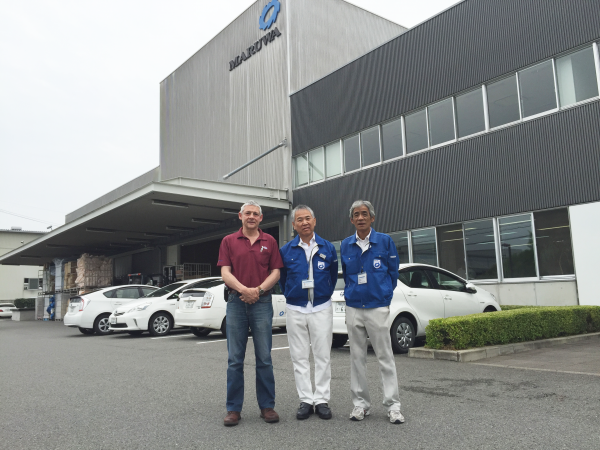 The CEO and owner, Mr. Masami Maruyama, has a longstanding relationship with Pellerin Milnor Corporation that started with the installation of a complete Milnor CBW-system, including a 12-module 76039 second generation CBW (rated 60kg). Maruwa has relied on Milnor’s tunnel washing technology to process its customers’ goods since 1995. Before the replacement, Maruwa was processing around 35,000kg (77,161 lb.) per day by running one Milnor CBW, one locally manufactured CBW and some washer-extractors. 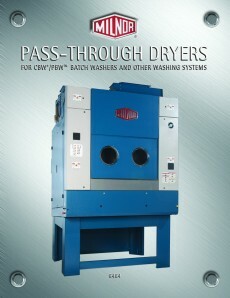 The Milnor CBW line was equipped with a two-stage press, four 58058 single-batch, steam-heated, pass-through dryers. The laundry ran one shift daily and the CBW had an average fresh water consumption of 9 – 10litre/kg (1.08-1.12 gal/lb). During 2010-2011, Milnor’s revolutionary PulseFlow® Technology CBW tunnel had been gaining a strong following and praise throughout the world. After careful testing and verification, the Hohenstein Institute awarded Pellerin Milnor Corporation its prestigious “Certificate of Innovation” for achieving as little as 2.5litre/kg (0.3gal/lb) fresh water consumption for light to medium soil. 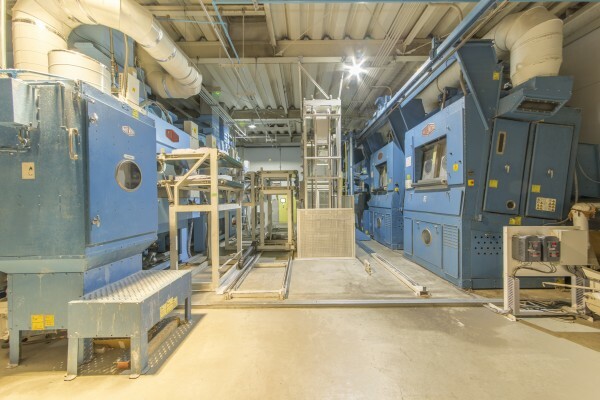 This technology not only proved to save an unprecedented amount of fresh water but has also been successfully implemented in every type of commercial laundry (from prison to healthcare, from dust control to industrial workwear). Presently, more than 250 PulseFlow tunnels are installed worldwide. In February 2015, Maruwa’s PBW tunnel was the first Milnor PulseFlow tunnel installed in Japan. This new 76039 (68kg/150lb.) 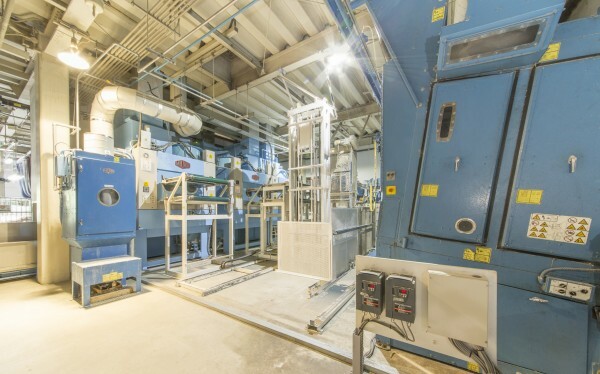 12-module Alternate PulseFlow tunnel replaced the conventional Milnor CBW in the Maruwa laundry. 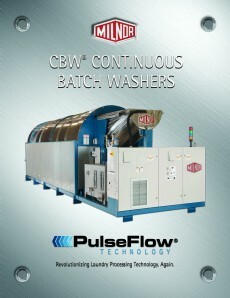 The Alternate PulseFlow CBW models provide a high level of control over the wash action in each compartment. In addition to “True Top Transfer™” and water reuse advantages, they also offer a flow configuration arrangement well suited for linen suppliers processing a significant amount of restaurant work of varying types and soil levels. (140kg/310lb.) double batch gas dryers equipped with MLF lint filters and a MultiTrac™ computer to manage the whole system, were installed. 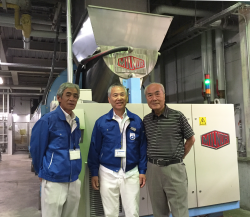 Mr. Maruyama also kept his old 12-module CBW but converted it to an 8-module and refurbished the controls. Thanks to the modular, flexible and robust structure of Milnor CBWs, this is always an option when a customer decides to keep existing equipment. 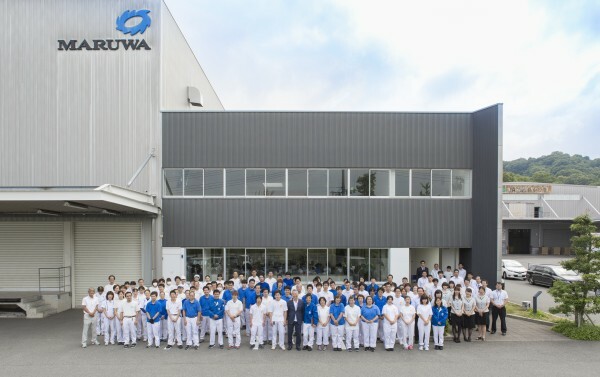 In addition, the substantial savings in utility consumption (the actual fresh water consumption with the new PulseFlow tunnel is around 3 l/kg (0.36gal/lb) and an increase in productivity from the PulseFlow Technology prompted Maruyama to order two new PBW tunnels for the Momonokikai healthcare laundry. A 12-module 76039 will be replacing a locally-built CBW and will be dedicated to flatwork. An additional 8-module 76039 will replace some washer-extractors previously dedicated to gowns, garments and heavily soiled items. Together with these two new CBWs, two additional 5050 gas dryers and a centrifugal extractor MMT4232 will be installed too. “Our new PBW tunnel uses far less water, electricity, and steam, than our other batch washers. These utility savings and increased productivity have allowed us to purchase two new Milnor PulseFlow tunnels (8-module and 12-module), which will be installed this October. Thanks to Milnor and PulseFlow Technology, this welcome addition to our facility will ensure prosperity and workers’ morale for years to come," said Mr. Maruyama.